Baked gluten free oats, cashews, almonds, hazelnuts and maple syrup with sunflower seeds and pumpkin seeds. Made in small batches. High in fibre. Source of protein. Gluten free. Vegan friendly. We love the nutty, crunchy texture of this recipe. To make it, we crush the hazelnuts, before tossing them with gluten free oats, maple syrup and orange juice. We then stir in cashews, almonds, pumpkin seeds and sunflower seeds and bake it all to perfection. 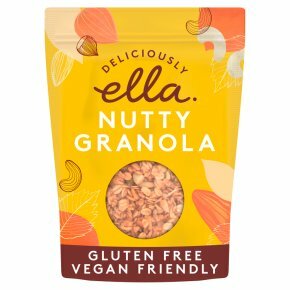 It takes time to create the perfect granola, so we make each bag in small batches. How We Like It: Berry Granola With creamy coconut yoghurt and fresh berries. Breakfast Bars Mixed with maple syrup, almond butter and then baked into granola bars.